A by-product of finishing a project and publishing the results is that one moves on – without necessarily losing interest in the subject matter. I spent about five months immersed in the study of my great-grandfather Edward Hughes Glidden’s architectural oeuvre, producing two books at Shutterfly.com about my findings: the first, E. H. Glidden: Baltimore Architect, is illustrated with historic images of his buildings, and the second (Glidden’s Baltimore: Works by Edward Hughes Glidden) is largely filled with 2014 photographs from a spring trip to Maryland. Various niggling questions remain, of course. 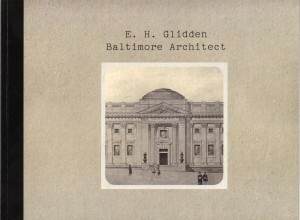 In May 1907, Glidden exhibited a photograph of the William F. Cochran, Jr., house at the Architectural Club of Baltimore show, implying – since everything else he submitted he had also designed – that he was the architect of this house. Cochran’s purchase of the Oscar F. Bresee house on Mount Vernon Place is well-documented (in The New York Times of 28 July 1902, for example). The Times article reported that Cochran – in preparation for his marriage to Miss Nina Gill in the autumn – planned to remodel his new house. I wondered: Did Glidden work on the remodeling, or did client and architect decide to tear down the Bresee house and start again from scratch? 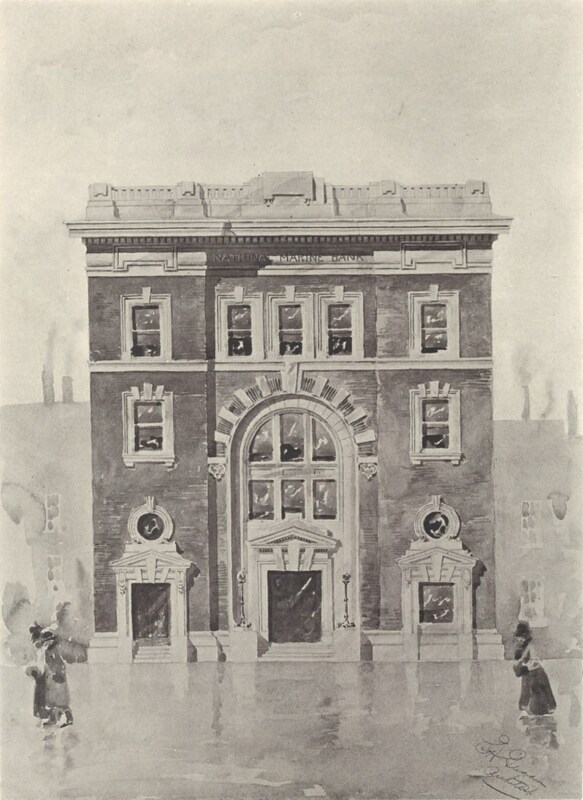 Or did Glidden simply admire the existing house at 6 West Mount Vernon Place, and express his admiration by photographing the house for the exhibition? 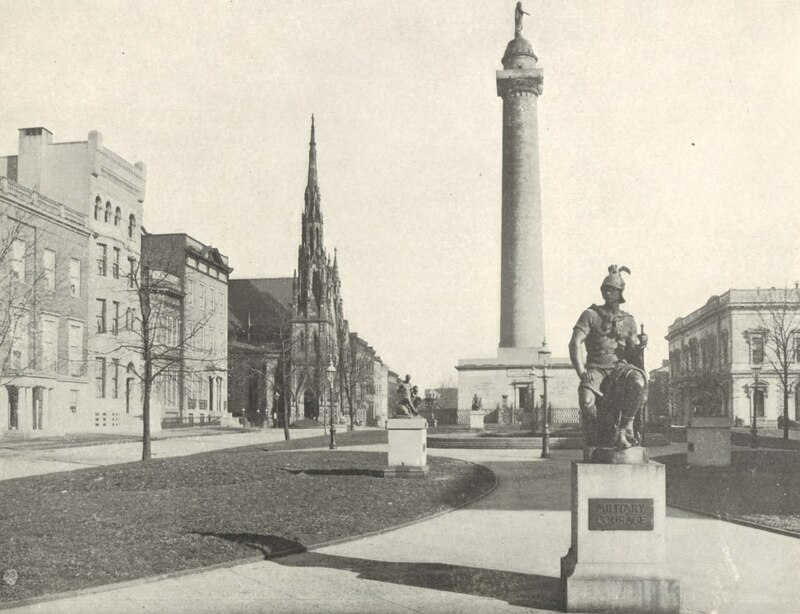 What I did know was that in 1905–6 Cochran employed Glidden for a much larger undertaking: the design and construction of the Washington Apartments at the corner of North Charles Street and West Mount Vernon Place – and next door to the Cochrans’ house. Several weeks ago I found a Souvenir of Baltimore, a 1904 publication that settles the matter. 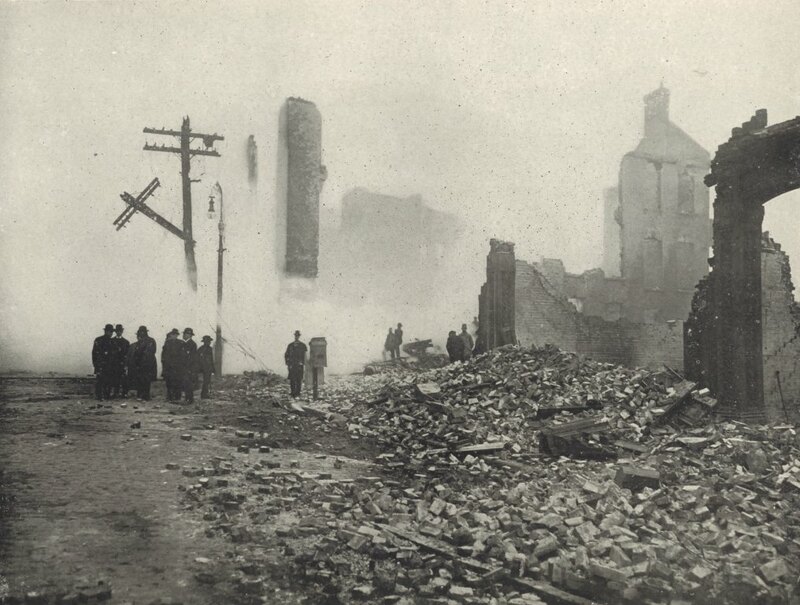 Published in the wake of the Baltimore Fire of February 1904, Souvenir of Baltimore shows a city still reeling from its catastrophic effects: whole neighborhoods were destroyed. The Marine Bank was razed to the ground, as shown above; later, in July 1904, E. H. Glidden was hired to build the replacement building, which still stands today. The Bresee/Cochran house is second from left; the two houses beyond it were torn down to make way for the Washington Apartments. Here and there are images of sections of the city outside the fire’s radius, and so I found my answer: the E. M. Greenway house and a smaller, neighboring building stood next to the Bresee/Cochran house in 1904. In 1905, Cochran bought both houses and tore them down, and the Glidden-designed Washington Apartments rose on the site during the next year. Much as I would like to claim the Bresee/Cochran house for Glidden, I am glad to know a bit more about the history of Glidden’s relationship with Cochran, for whom my great-grandfather would still be working as late as 1919. 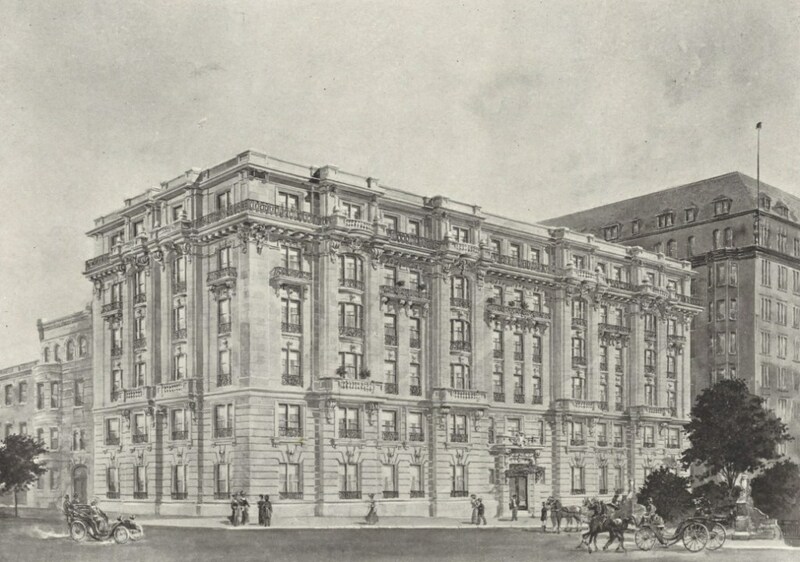 E. H. Glidden’s design for the Washington Apartments; the Bresee/Cochran house is at left. “Niggling questions” is a great phrase to describe the pieces of the puzzle that have not quite fallen in to place. Good post. I am really enjoying this blog, and this entry is a good example why. It shows me more ways to get beyond the “conventional” genealogy” of charts, names, and dates, to show lives in more rounded ways. Thank you. Thank you, Annie! What a lovely compliment! My name is Jeff Dean, and I am the project manager for the redevelopment of the Marlborough Apartment in Baltimore, which your great-grandfather designed. I’d like to talk to you about this project, if you’re available. Send me an email when you have a chance.